You already know that it doesn't matter what you wear to play a pickup game of soccer and that some form of the game can be played just about anywhere. Playing on an official team is a different matter. 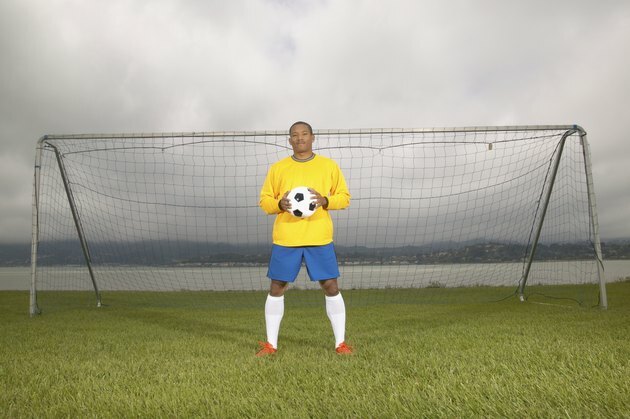 Rules governing clothing vary depending on the type of soccer league and where it's located. For serious teams, the regulations of FIFA, which governs World Cup play, are generally followed. The team or league you play for often provides uniforms for players. Most soccer teams outfit players with a T-shirt or jersey in the team colors. A number to identify players is marked on the back of the jersey. Jerseys are generally short-sleeved, although long-sleeved shirts are not uncommon and perfectly acceptable. If the weather is cold you can wear a long-sleeved shirt under your short-sleeved uniform top, but FIFA regulations state that the sleeves must be the same color as the top shirt. A goalkeeper's shirt must be a different color than those of the rest of the team. Field players always wear shorts made of lightweight material with an elastic waist. FIFA regulations allow for an extra pair of shorts under the main shorts as long as they are the same color. One-piece suits are not allowed in soccer. A player's number is often printed on the shorts, but not always. Goalies can wear long pants, often with padded hips. Socks and shin guards are required protective equipment for FIFA play. USA Youth Soccer, which oversees the majority of soccer leagues for kids, also requires that shin guards be worn for all practices in addition to games. FIFA prohibits items that can cause injury to other players but notes that headgear, face masks and other items made of soft and padded material are acceptable. Referees inspect players before a game and may disapprove the use of protective gear. Goalies are allowed to wear gloves. Soccer shoes come in a few different styles, depending on the type of playing surface for the game. You will typically wear cleats to play games and practice on natural, outdoor surfaces. Cleats are molded into the bottom of soccer shoes, or are detachable, and help provide traction on slippery or unstable surfaces. For playing on indoor surfaces or artificial turf outdoors, shoes have grooves and patterns on the bottom, rather than cleats. Metal cleats are not prohibited for FIFA play, but youth and high school leagues set their own rules regarding cleat types. Referees will check the bottoms of shoes to ensure cleats are well-maintained and not sharp enough to injure other players.